Hello again so soon. I will try keep you from getting bored, so here are some more subjects for debate. 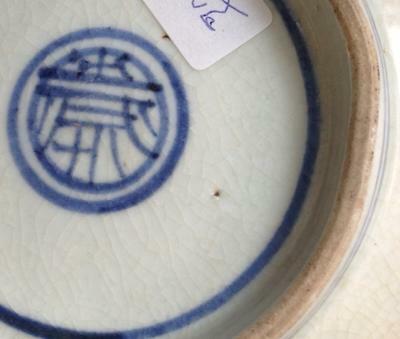 I found this really good bowl today, somehow it evaded my eyes before. It appears to me to be authentic for the most part. 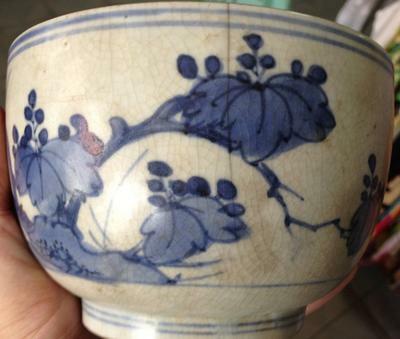 The quality seems good and it is a little bigger and of a different shape than the usual bowls I look at. 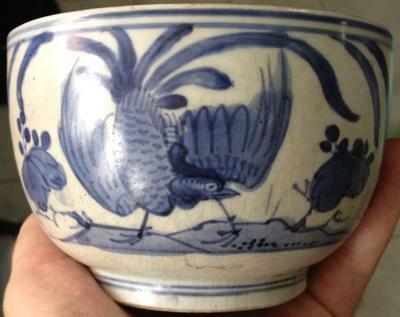 To me it looks like a Ming Dynasty bowl with the artwork and colors that are so similar to some other Ming bowls I have. The only part that throws me off is the mark on the bottom. I have no idea about that particular mark. I really look forward to your opinion and knowledge on this one. Comments for Can you help with this one? Thanks for the feedback Peter and Linda. I am not too sure about this bowl as well. I thought the artwork to look like a Ming style perhaps. I have done some looking on the internet for any items with similarities, but so far I haven't found anything. I do agree that the bottom does look too white and different than the rest of the bowl. I may ask the owner if I can wash it to see if and how any of the brown will wash off. 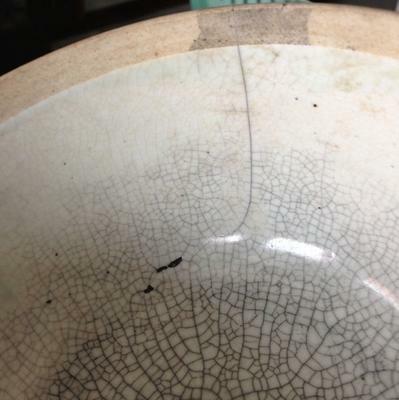 I bought a cheap fake here before with a brown substance wiped on to give it an aged look, although I don't think this bowl has that stuff. I have boughten real pieces here with years of dust etc. on them too which washes off easily. I want to give it a closer examination for use wear and other age signs. I hope to use my good camera to capture any other detail on this one too. I will let you know what I find out about it. Talk to you soon.. If this should be a phoenix, then I am convinced it was made in SE Asia. Chinese painting style never paints phoenixes that way. Contrary to what some may think, in Chinese arts and crafts the tail (number of feathers), body, head and crown (different according to male or female phoenix) all conform to certain requirements, which this bird doesn't follow. 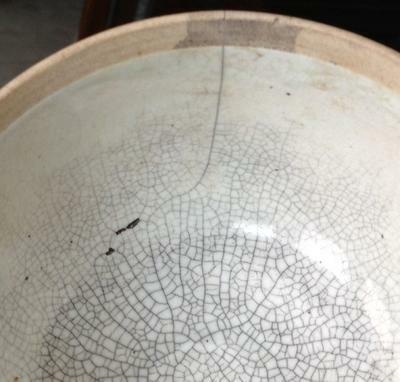 Did you notice that the bottom is very white with crackling, while on the rest of the body the crackles are discolored? With crackle items this color may be because of dirt lodged in the cracks, if natural, but how would it be possible to explain the difference between bottom and exterior? Also, I do not trust this funny mark. Never seen anything even faintly resembling this. There are too many questions with this item, for my taste. 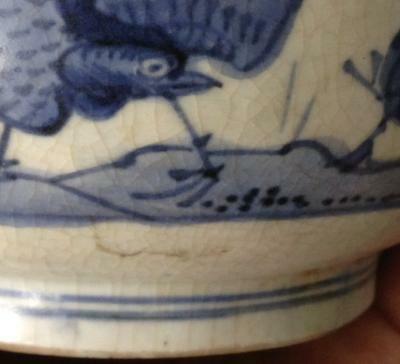 I don't think this is a Ming dynasty bottom. The decoration makes it look late Qing to early republic, in my eyes, but there is a chance that it is not Chinese at all. 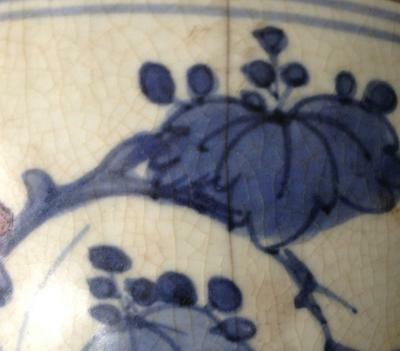 The decoration style and tone of the blue color do not seem to be right for Ming or Qing. It looks more as if it incorporates elements that China started only using under the influence of western arts, later on in the 20th century. The blue also has an uncharacteristic tone. After ripe consideration I think there is a good chance that it is Japanese. Hello! I noticed one of the photos did not work during the upload, so I have some more. The crackling on the inside is kind of nice. I hope these will help.